ISS034-E-060222 (3 March 2013) — This is one of a series of photos taken by the Expedition 34 crew members aboard the International Space Station during the March 3 approach, capture and docking of the SpaceX Dragon. Thus the capsule begins its scheduled three-week-long stay at the orbiting space station. NASA television coverage for today’s scheduled launch of the sixth SpaceX commercial resupply services mission to the International Space Station has begun and can be seen at https://www.nasa.gov/nasatv. Countdown is progressing smoothly toward a scheduled lift off at 4:10:41 p.m. EDT from Space Launch Complex 40 at Cape Canaveral Air Force Station in Florida. The weather forecast remains at 60% “go” with concerns for anvil and cumulous clouds. 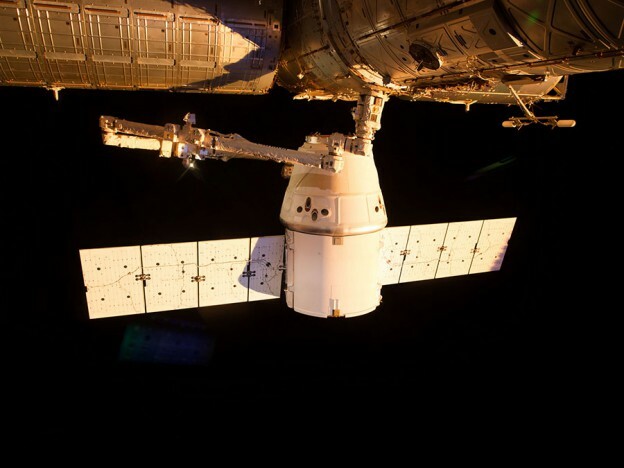 The Falcon 9 rocket will launch a Dragon spacecraft carrying about two tons of supplies and materials to support about 40 of more than 250 science and research investigations that will occur during the station’s Expeditions 43 and 44.